This episode largely deals with the revelation from last week that the masked vigilante in black who has been doing a number on Starling’s various criminals is none other than Sara Lance, sister to Laurel Lance and daughter to Officer Quentin Lance. And a former fling of Ollie’s, someone who was supposed to have gone down with the Queen’s Gambit when it sank over six years ago. As we learned last week, she was picked up by the crew of a ship that had been passing through the area at the time and the rest is history: she joined the League of Assassins and was trained to be one of their foremost members. Given that Sara is now back and that she has reconnected with Ollie, it stood to reason that she would eventually reach out to her family, in her own way, and the episode largely focuses on her doubts as to whether that is a good idea. Its not like she has much of a choice though really since the League is hunting her and will have no scruples about using her family to get to her. All this interaction ends up as a tie-in for what Ollie is going through himself with his mother’s trial and the death penalty that the Starling DA is seeking as her punishment for her involvement in the destruction of the Glades. It was a really good way to explore these two characters, and it even helped to give a lot of context to the trials that they are going through and have gone through aboard the ship in question. And given how that particular story is developing (we get to see how Sara was rescued by the ship, which makes for the first ever flashback confirmation of her survival), it is not a stretch to imagine that some of the future episodes will deal with how she got on the Island as well, since Ollie has brought that up a couple times or so by now, in conversations with Diggle and Felicity. I’m seeing a lot of parallels here with how Helena Bertinelli joined up with Ollie & Co. last year and how she ended up being a major anti-hero for those appearances. Things are different with Sara of course since she is someone that Ollie knew as a kid and was briefly romantically attached to, and has gone through a lot of hardship with together. And Sara is a very different person than Helena either way. But it is interesting to see how things go from here, particularly since Sara shows some good rapport with both Diggle and Felicity, which was a small element of the season that I really enjoyed. There were some really cool action scenes this time around as Sara (who confirms later on that she took the name Canary when she joined the League of Assassins) and Ollie go up against three highly trained and capable agents of the League. One of them in particular is the man who trained Malcolm Merlyn in the first place, and there’s some tete-a-tete between him and Ollie about Malcolm’s death and how hard-pressed Ollie was when fighting him. I’ll admit that whenever Sara brings out her staff, I get really excited, since its as much pure badassery in close-quarters fighting as Ollie’s bow is at range. No guns, no shots. And Sara is lethal with it, and certainly doesn’t need any help from Oliver. Caty Lotz delivered a better performance this time around since she got a lot more diverse material to work with this time around and her chemistry with Stephen Amell is obvious and realistic. The same as it is for their characters in fact. Some of her dialogue feels a little stilted, given how formal it can be at times, but overall, I really like her in the role. And I suppose how heavy-handed her identity as Canary as being established, that Katie Cassidy’s Laurel Lance is out of the picture as ever becoming that character, as she is in some of the comics from a few years ago. Katie’s Laurel gets little to do this time around, which was fine with me since I’m not seeing much of worth in her character right now. Her characterisation feels a little off this season, which is perhaps reflective of everything she’s been through so far this time around, but it jars all the same. As I said, much of the earlier supporting cast is absent this time around. Such as Roy Harper, Slade, Shado, Brother Blood, Isabel Rochev etc, but we do get to finally get to see Dr. Ivo, the man who created AMAZO, a sentient android who could mimic the power of any superhero or supervillain and grew with each since he could store those powers permanently. If that is indeed the direction that the show is going for in this season, particularly since we are going to be getting Barry Allen aka Flash very soon, well, that’s going to be rather spectacular now isn’t it? And when does Canary get her cry? Lots of questions to be answered in the coming weeks. In the meantime, I’ll say that this week’s episode rocked, and that I really enjoyed it. Some really emotional scenes as well, the family ones, and it ends on an intriguing cliffhanger aboard the ship, which is also called Amazo. 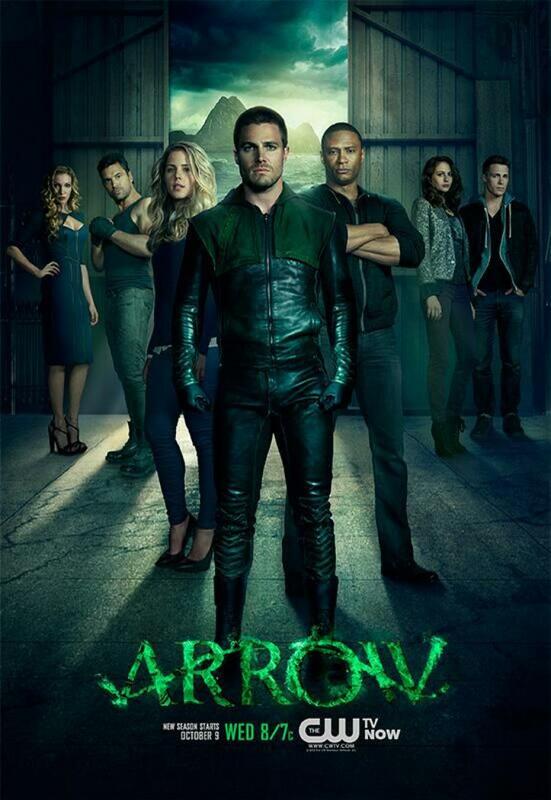 More Arrow: S2E01, S2E02, S2E03, S2E04. Posted on November 7, 2013, in Arrow, Review Central, TV Show Reviews and tagged Arrow, Black Canary, CW, David Ramsey, DC Comics, Deathstroke, Dollmaker, Emily Bett Rickards, Felicity Smoak, Green Arrow, John Diggle, Manu Bennett, Oliver Queen, Review Central, Slade Wilson, Starling City, Stephen Amell, Superheroes, Supervillains, TV Show, TV Show Review. Bookmark the permalink. 5 Comments.